We departed Singapore on Oct 27 under hazy skies. Again we played the game of "Frogger" with supertankers as we rounded the corner Northwest from the Singapore River into the Malacca Straits. 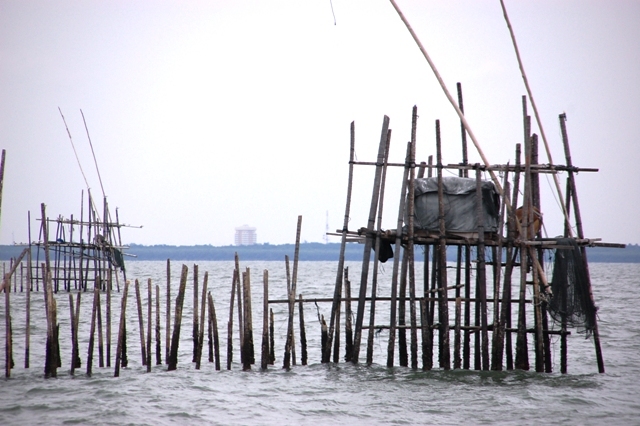 The Malacca Straits have been steeped in superstition and dread since the first time traders crossed these waters...old charts even showed resident dragons and sea monsters. The dragons and sea monsters of yore have been replaced by hundreds of thousands of commercial cargo ships of today. 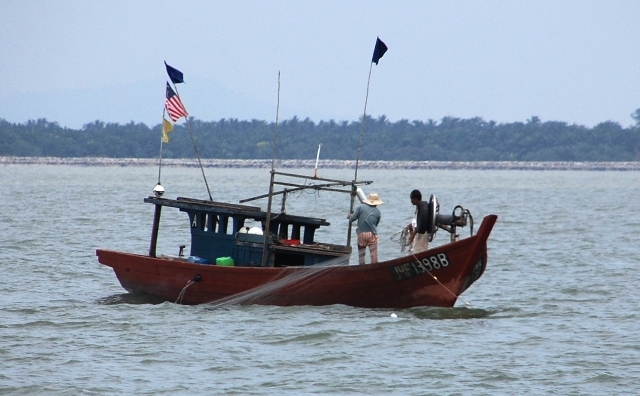 Fairly recently, the Malacca Straits were notorious for piracy; luckily, this is not the case today due to co-operation between the authorities of Indonesia, Malaysia and Singapore regarding anti-piracy measures. 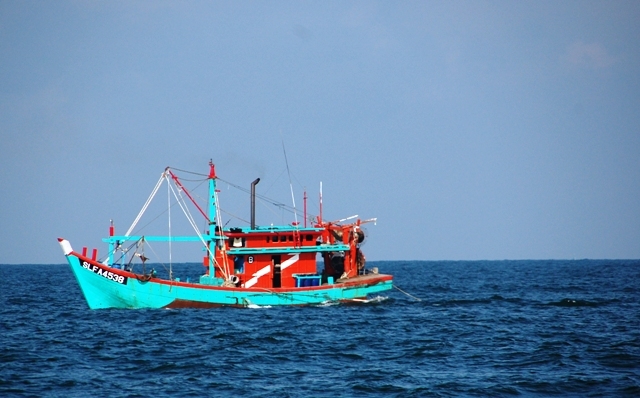 However, we still played it safe and hugged the Malaysian side of the Straits rather than the more unstable Indonesian coast. Once around the corner we tried to stay between the shipping channel and the fishing grounds. It proved to be much easier to avoid the supertankers than to avoid the indiscriminant strings of fishing nets...snagging one just 1 hour from our anchorage and 2 hours from sunset after a 70 mile run (Oct 28)...drat. We were just off the Water Islands when we hooked a net on the starboard propeller...aaaggghh. Erin stopped the engine and furled the headsail while Chris worked with the boat hook at untangling the web of gill net from the propeller. It took about half an hour to get free but it looks like Barefeet is okay and any damage we did to the nets was minimal...no cutting occurred. Chris dove on the propeller once we were anchored...no fun in practically zero visibility (not until his mask bumped the propeller did he know he was there)...without any sign of ropes or nets. Phew! We were more vigilant going forward but needed to add floating detritus of all sorts to the list of what to watch out for...especially logs. Unfortunately, we bumped over a log that was nearly submerged but thudded LOUDLY under the hull. 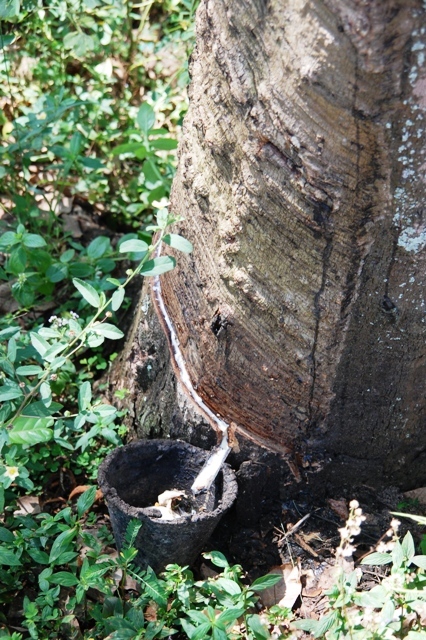 We do not think any major damage occurred but we'll take a closer look when we haul out in Thailand. So much hazard watching was tiring and we were glad to arrive Oct 29 at Admiral Marina (www.admiralmarina.com.my). The marina is part of a larger development of vacation villas similar to Nongsa Point...sadly, a bit over built and under utilized...kind of like a resort during the off season. That said we loved the restaurant; floating pontoon slips with water and power; and friendly, knowledgeable staff. Omar got our electrical sorted out and Veronica checked us in so that we could start planning our inland land travels. 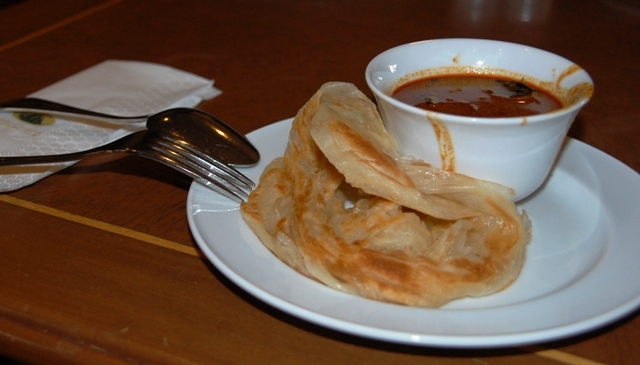 At the marina restaurant we were introduced to roti canai (pronounced row-tee chan-eye). 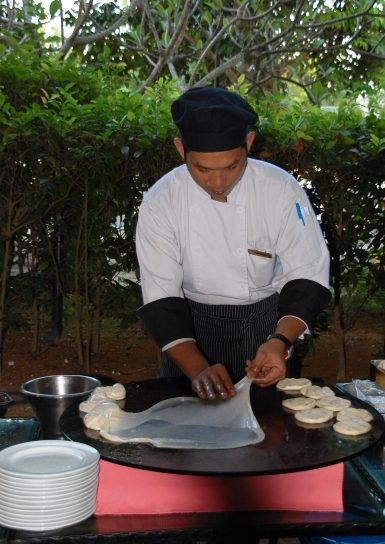 It is an Indian bread similar to naan only flakier...like a croissant. It is served morning, noon and night and often accompanied by a small bowl of fish curry...flavorful! But not fishy tasting at all...even Chris loved it. 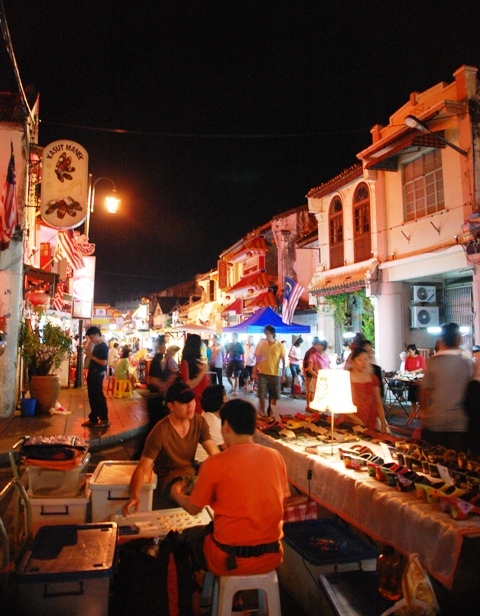 Malaysia has long been a rich trading post...the Malay Kingdom of the fifteenth century rivaled the empires of Thailand and Indonesia. This fact did not go unnoticed by the Europeans who quickly moved in. The Portuguese were first thanks to the conquering Don Afonso de Albuquerque in 1511; followed by Holland in 1641 with the Dutch East India Company; and finally the British in 1808. Britain added wealth of resource extraction (tin and rubber) to the existing trading successes and it was full steam ahead economically. 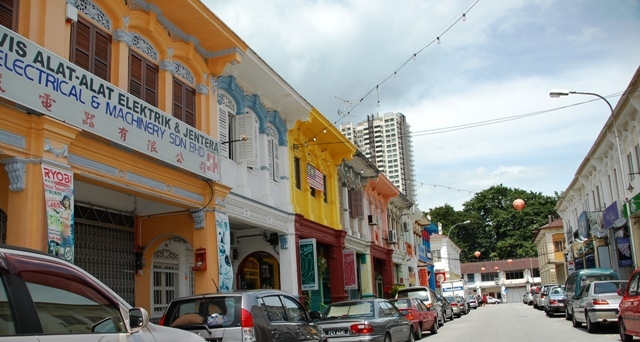 Independence came in 1957 with continued growth (including palm oil) and Malaysia's current standing as the region's second most vibrant and diverse economy. 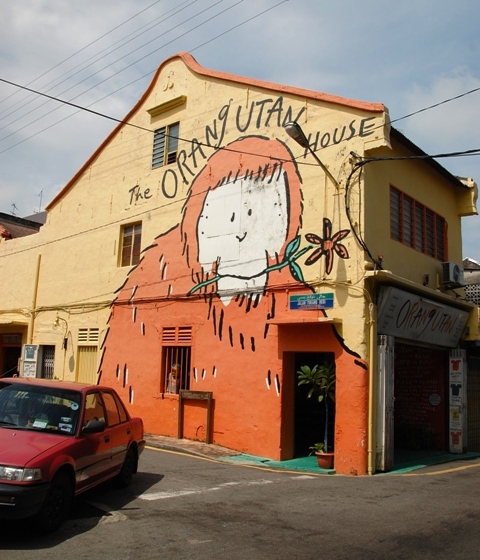 Malaysia was a bit of a blank slate for us personally and we looked forward to learning about it. So, we left Barefeet at Admiral Marina and headed inland. 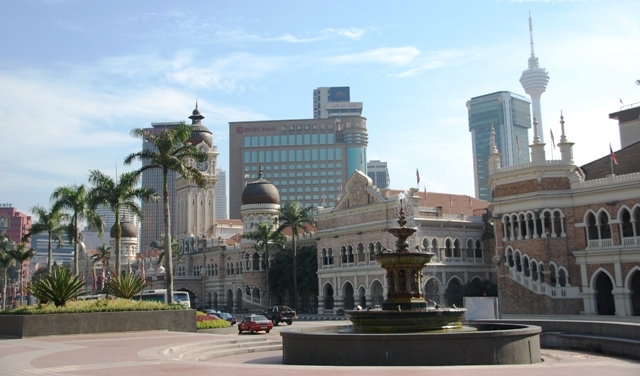 Oct 31 we took the commuter train into Kuala Lumpur (KL), Malaysia's capital. Hhhhmmm...we are feeling very different in appearance here. 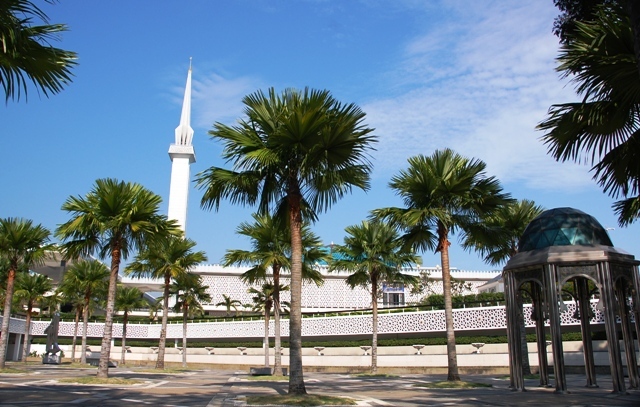 Islam is the state religion for Malaysia and head scarves are abundant. Additionally, there are large Indian and Chinese communities which often wear the traditional sari and cheongsam. The voluminous swaths of fabric are beautiful and sparkling...vibrant in color and often adorned with rhinestones. Chris felt self-conscious in his shorts (bare knees) but we were never greeted with anything but smiles. We wandered the streets from sight to sight and hailed a metered cab when we were pooped. 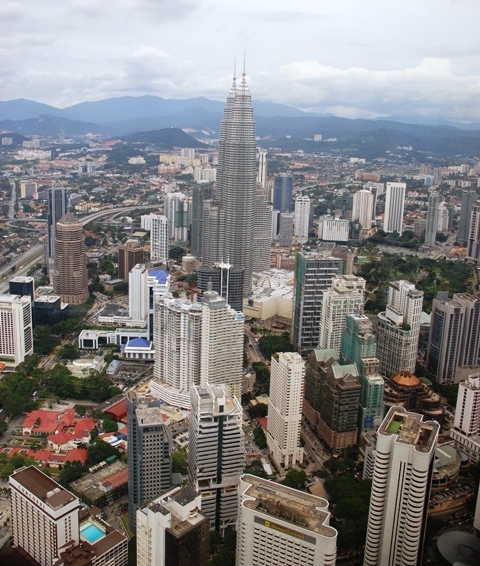 We got a bird's eye view of the city from atop the Menara Radio Tower (www.menarakl.com.my). Completed in 1996 it is the fourth tallest telecommunications tower in the world (1300+ feet). Below us the city sprawled with skyscrapers, gardens and transportation of all kinds (including a monorail) all neatly bordered by lush, green hills. 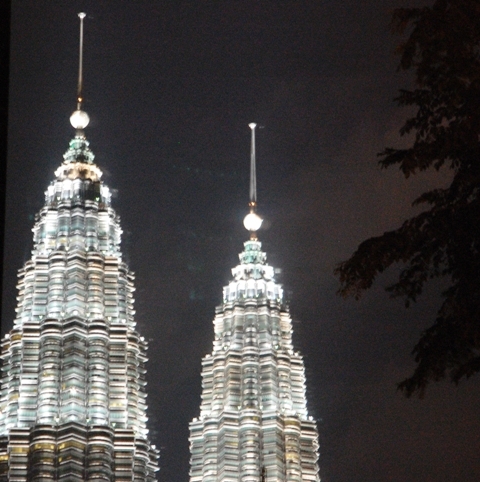 A real "must see" for us was the Patronas Twin Towers building at 1484 feet high. This world's tallest building (okay, tallest until 2004 when it was surpassed by the Taipei 101 building) is impressive both day and night. 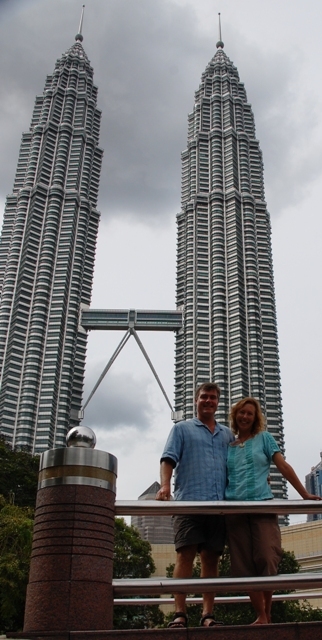 We joined the throngs to have our picture taken with the towers behind us. Later, we happened upon a great little expat bar called Little Havana (on Jalan Changkat Bukit Bintang) and watched the last two innings in the final game of the World Series...feeling very American as we watched the action on a big screen TV with our french fries and cocktails. 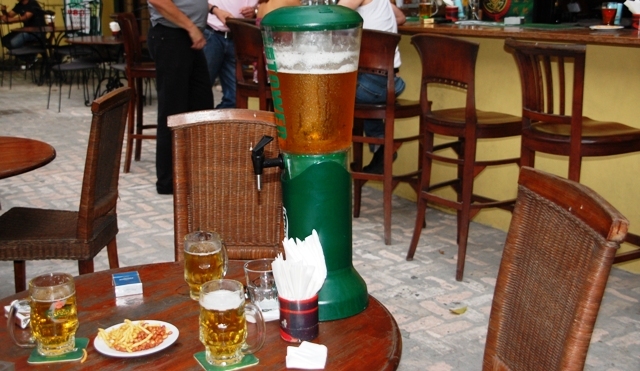 It seems everything is a tower in KL...even the beer deal...a "beer tower" for happy hour prices. Oct 1 we visited even more sights. 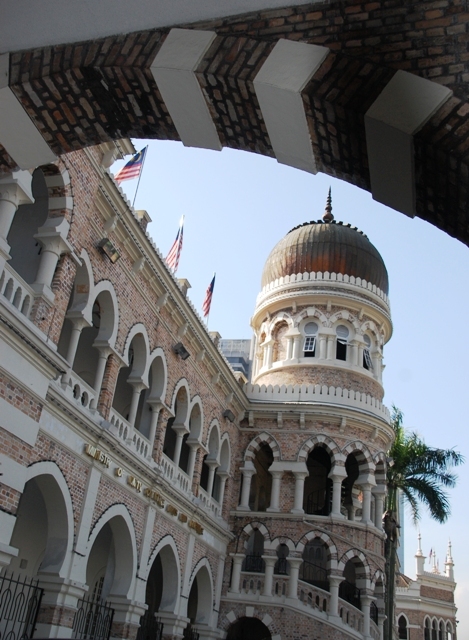 The Sultan Abdul Samad building was completed in 1897. 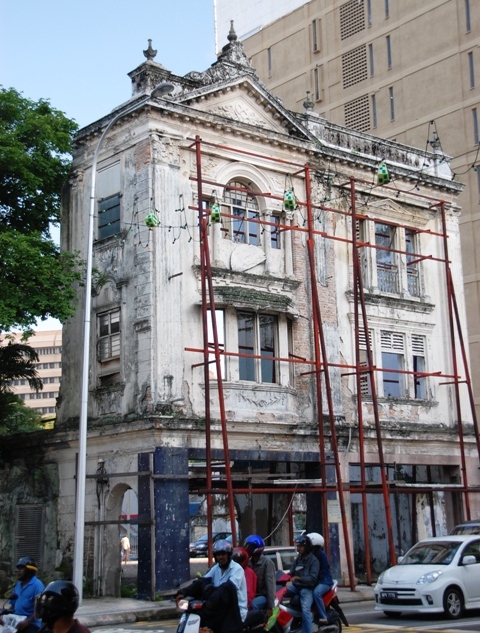 It's unchanged facade is a strikingly Moorish-style red and grey brick that was the center of the colony's administration under the British. Today it is a "temple of justice" which houses the federal court, appeals court and the high court. Another stop, the National Mosque was stark and impressive (completed in 1965). 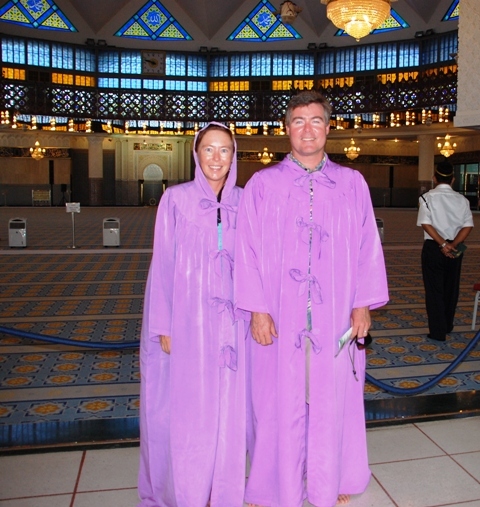 We donned the provided purple burkas and looked around...discovering that these tents of fabric are not, in fact, light and airy. 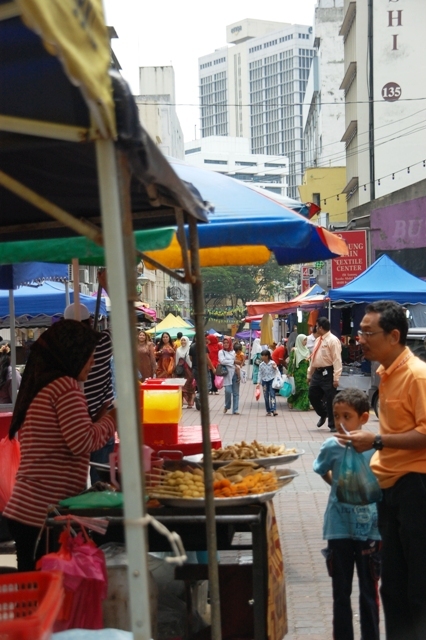 A bit more street food sampling as well as some resting in the air conditioned Hotel Noble (www.hotelnoble.com) before viewing KL at night. 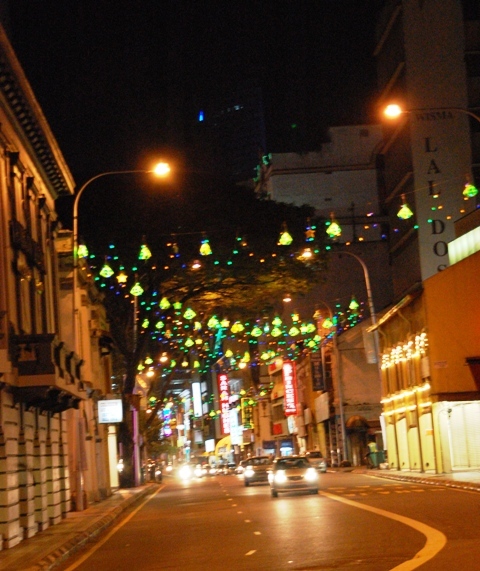 KL is appropriately named the Garden City of Light...a jewelry box of colors and light strings on anything that does not move. Nov 2 we took the intercity express train from KL to Tampin...splurging on first class tickets ($9 per person) for the 1.5 hour trip. 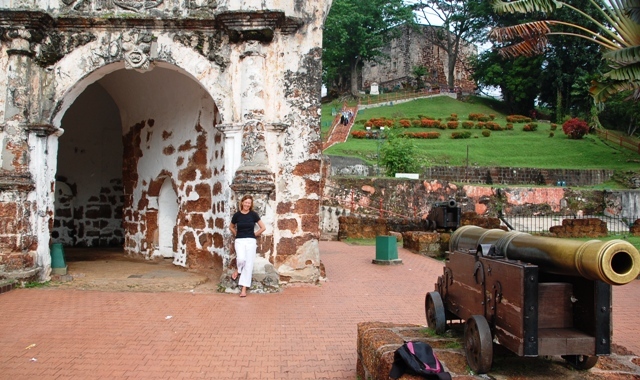 Then a quick taxi ride from Tampin and we were in Melaka. 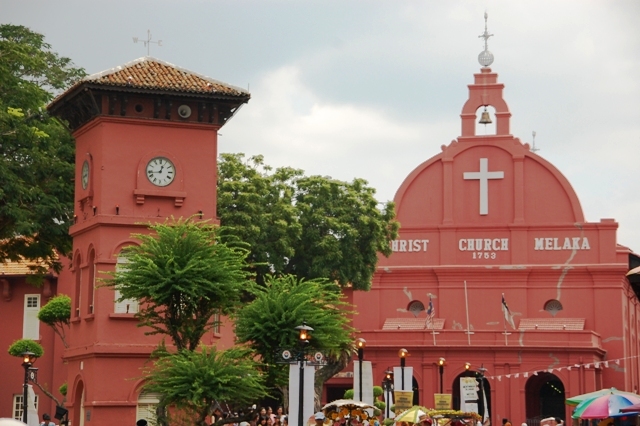 Melaka is Malaysia's most historic town...being at the center of Malay trading since the beginning; fifteenth century splendor through to the arrival of the Europeans. 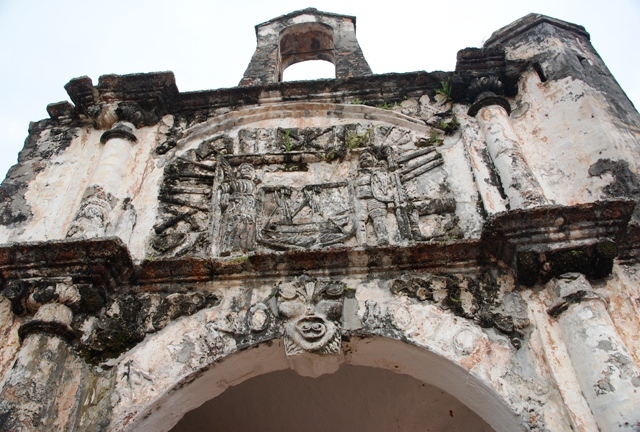 It was here that Don Alfonso de Albuquerque symbolically constructed a fort, A Fomosa, on the site of the sultan's palace...later taken by the Dutch to which they added the mark "VOC" of the Dutch East India Company in 1641 (which Chris searched for until he found it...on the shield of the person center-right)...and finally by the British in 1808. 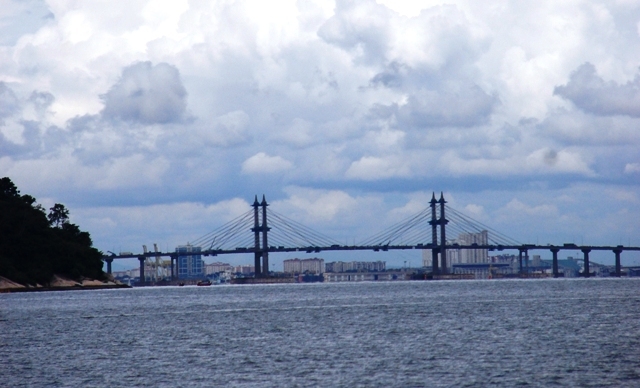 Today the river has silted and large ships are no longer able to arrive; however, the history remains. 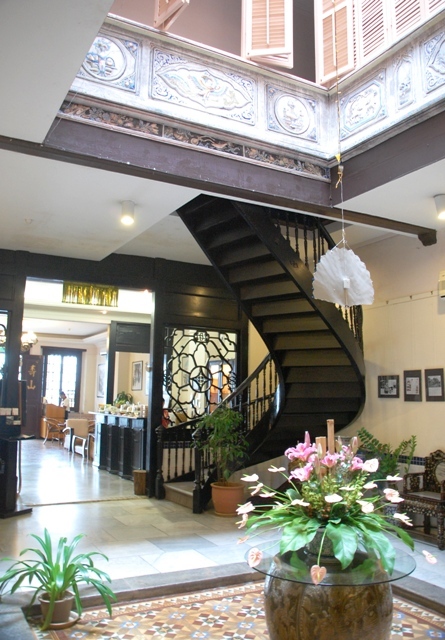 First stop was the Hotel Puri (www.hotelpuri.com) so we could drop our bags and freely explore the city. 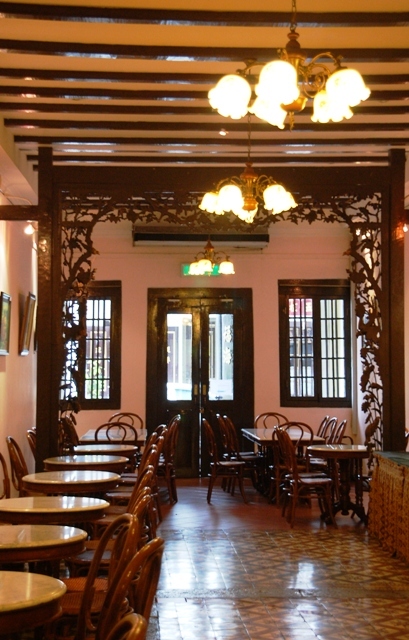 Hotel Puri was originally the home of a wealthy merchant...a Chinese family that intermarried with local Malay women. 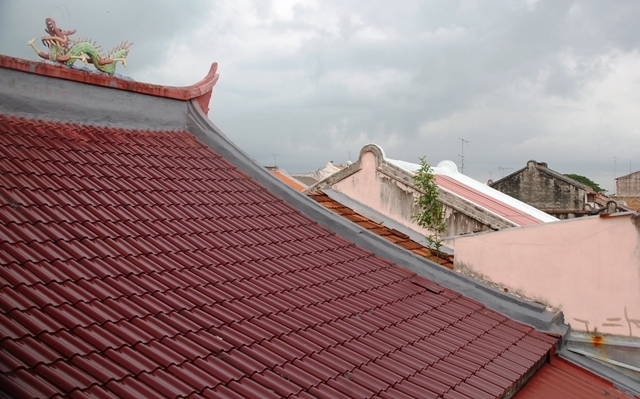 This unique combination of cultures became known as the Babas (men) and Nyonyas (women) or "Straits-Born" Chinese in which the descendants were Chinese in spirit and tradition but Malay in form. The home of the Babas and Nyonyas directly reflected the financial success of its occupants with neo-classical European architecture, Greco-Roman columns, mosaic tile floors and intricately carved fittings. The result was nothing less than opulent. 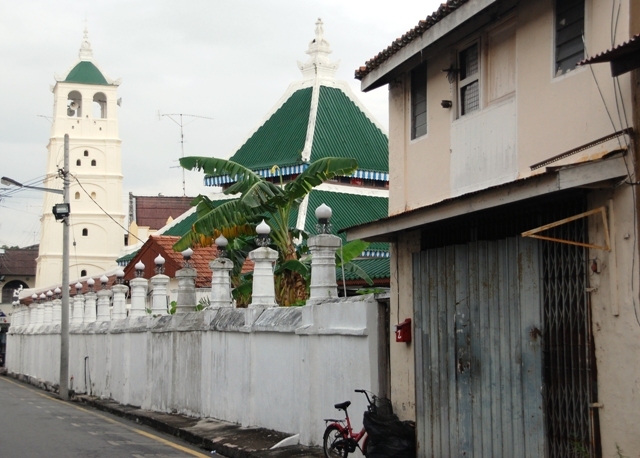 The building styles of the city are a real combination of its heritage...from the Dutch Stadthuys and Christ Church to St Paul's Church built by the Portuguese (later becoming a Dutch burial ground) to the Kampong Kling Mosque (which incorporates Sumatran architectural features) to the Straits-Born Chinese homes on "millionaire's row." Erin found some fun t-shirts at the Orangutan House shop (www.charlescham.com) while Chris settled into a coffee shop with a book. Later, as we had Chinese tea in a tea house the woman walking us through the process mentioned, after seeing Chris's bright red face that Chris looked like...Hell Boy...seems it is the only English she knew but the heat and humidity's impact on Chris made an impression (the movie "Hell Boy" is really good...check it out). 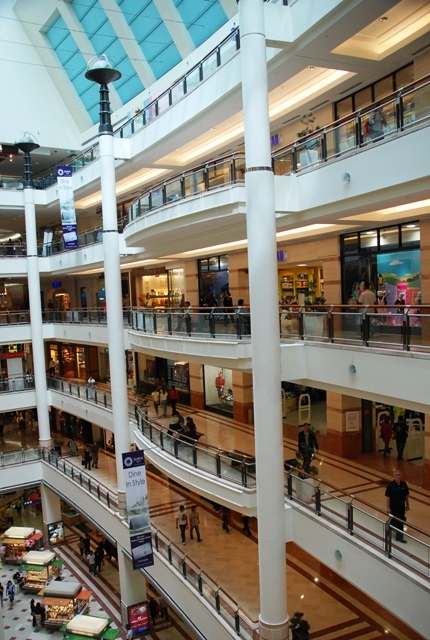 We soaked up as much of the place as possible from smells to tastes to sounds. 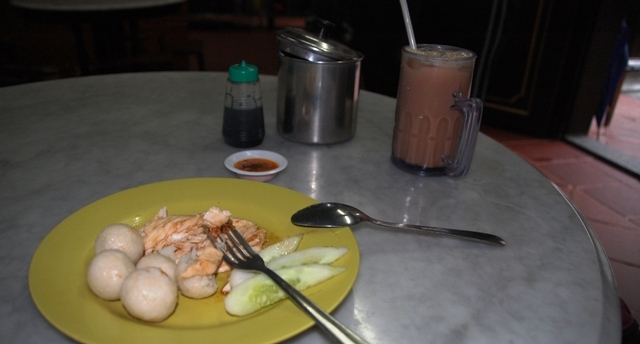 Melaka has a twist on the Singaporean chicken rice in that the rice is served as a small ball...originally formed with spoons but now popped out of a machine. Very tasty. 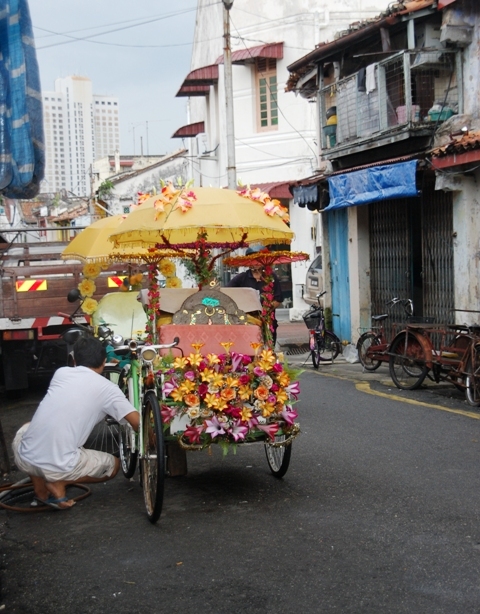 Even the sounds of Melaka are unique...tri-shaws tinkling and spinning along the narrow streets with a background of hundreds of squawking starlings. Interestingly, we had a delicious Italian meal overlooking the Melaka River at Harper's Restaurant (No. 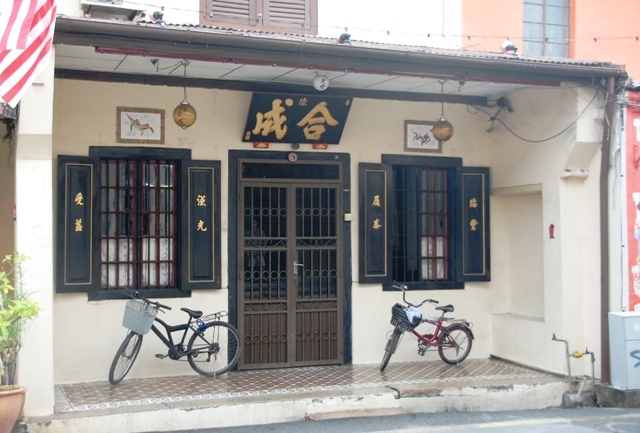 2, 4 Lorong Hang Jebat). It was quite amazing to nibble mushroom lasagna and beef tenderloin as monitor lizards swam in the river below our table...wow! Well, the camera ran out of battery power and it seems we need to head back to Barefeet. 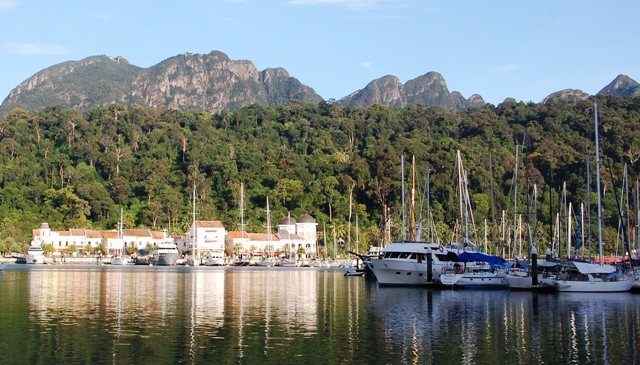 Back at Admiral Marina we got on-line to take care of administrative stuff like bills and insurance renewals as well as to plan our next hop Northwest along Malaysia's coast (Nov 4). Unfortunately, Mother Nature had other plans and we awoke to howling winds and torrential rain...we waited to leave for one more day. 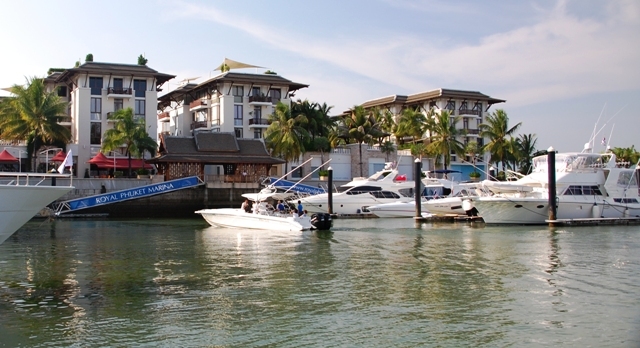 Nov 6 we were off the docks at Admiral Marina headed for Pangkor Island. The forecast was for light winds on the nose but it ended up being a 36 hour slog in constant 20 knot head winds. It was not our worst run but certainly not our best, either. Pangkor is a small resort island where we tucked into a cove and immediately went for a swim. The water is still murky but it was wonderful to splash around in the warm, clean water. We sat on the deck with sundowners and watched the countless motorcycles zip along the shore road as restaurants geared up for Friday night festivities. 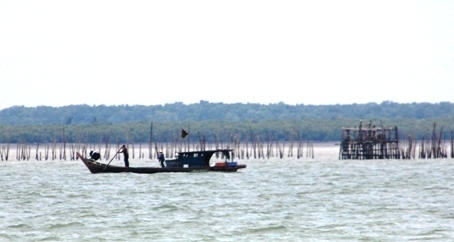 However, we did not go ashore because we left the next morning at 4am for Penang...an 80 mile run (Nov 8). Luckily, the currents were with us and we arrived at Tanjong City Marina at 4pm...after weaving between numerous fishing boats and strings of nets (www.tgctmarina.com.my). 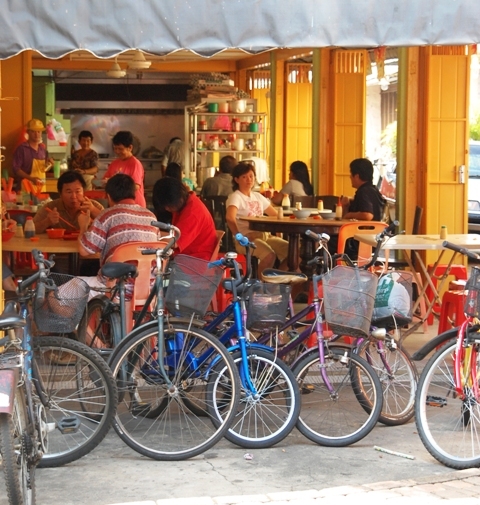 The marina prides itself on being Malaysia's only "inner city" marina and gosh did we love that. Step off the boat and you are right in the center of the town. Oh, but the flip side of "inner city" is vermin...spotted a couple of bloated, road kill rats floating in the water...eeekkk. No stowaways, please. 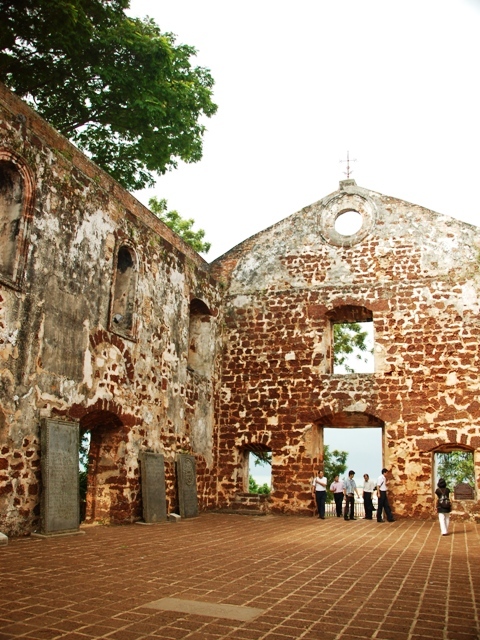 The island of Penang was the first British trading settlement in the Far East with Georgetown its main town. Under uncertain and shady circumstances Francis Light (British merchant operating in the region) negotiated a handover of the island from the Sultan of Kedah to the British in exchange for protection from, then, Siam (Thailand). 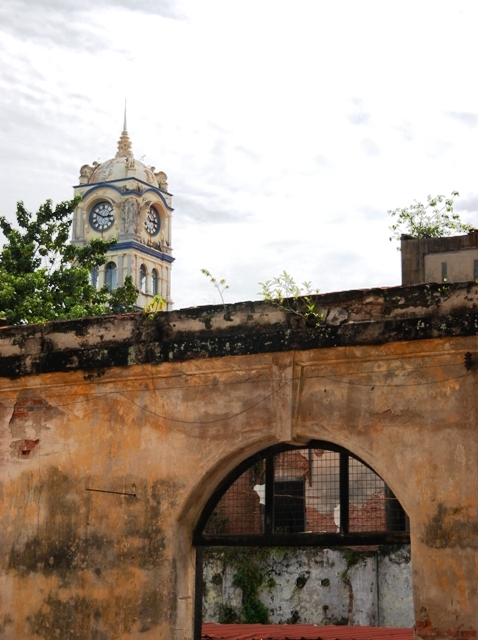 The British East India Company took up commercial activities and annually paid 6,000 Spanish dollars to the Sultan. Incidentally, the Penang government continues to pay the Sultan of Kedah a fee, in ringitt, to this day. 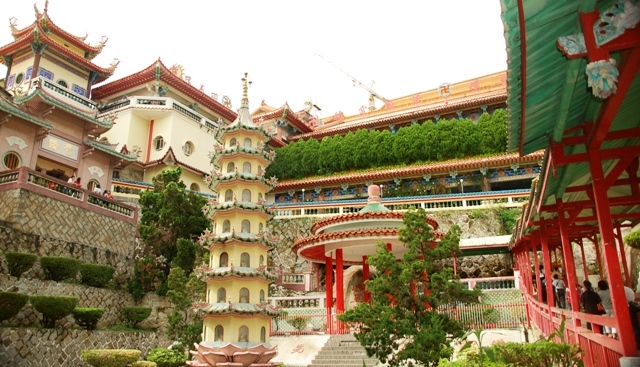 We especially enjoyed the Kek Lok Si Temple...just a 50 cent air conditioned bus ride from the marina. 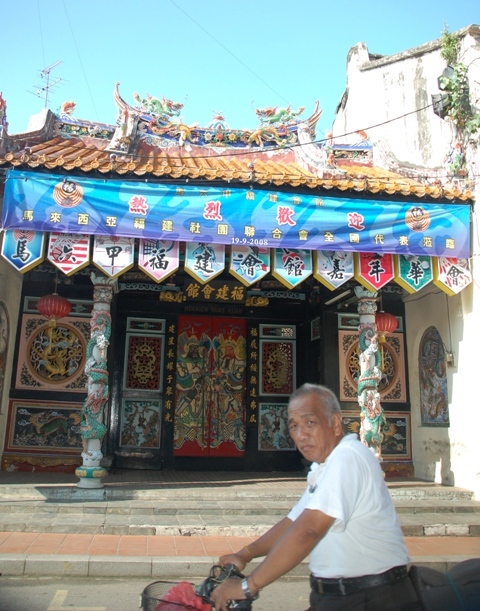 The temple is Penang's oldest...dating from the 1800s but rebuilt after the devastation of WWII...dedicated to the Buddhist goddess of mercy. 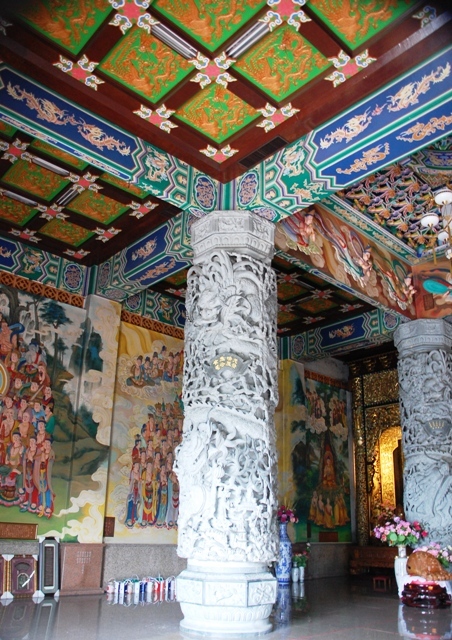 The temple was spectacularly beautiful with delicately carved, massive granite columns; mosaic tiled floors; gilded Buddha statues and intricately painted walls and ceilings. 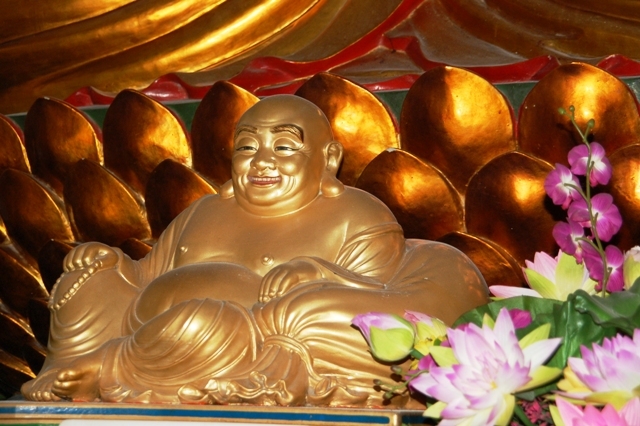 Incense sticks burned in front of each Buddha creating literal fogs of scented smoke. We slowly walked the numerous rooms and staircases...finally climbing the 193 stairs to the top of the pagoda for a panoramic view of Penang's capital city of Georgetown. Later in the afternoon we took a spin in a tri-shaw with a wiry, old Chinese driver that needed a bit of a push when we encountered small inclines...but the view of the busy streets from ground level was neat. Plus, this helped us canvas more of the city for our quick stop. We were off again Nov 10 for Langkawi. It was a civilized day with helpful current and both engines in full as the windex spun crazily searching for even a breath of wind...none to be found (Nov 10). 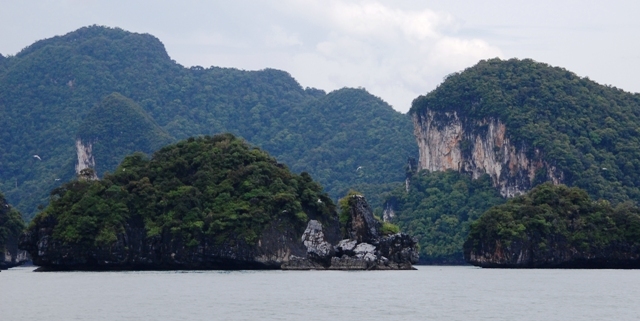 The sheer limestone cliffs were beautiful as we snaked through the islands of Langkawi. Pulling into Telaga Marina allowed us to check out of Malaysia, fill up Barefeet with duty free diesel and grog...and be off again in a day-and-a-half for Thailand (www.telagaharbour.com). Telaga is a lovely spot nestled in a cove surrounded by towering jungle covered peaks. 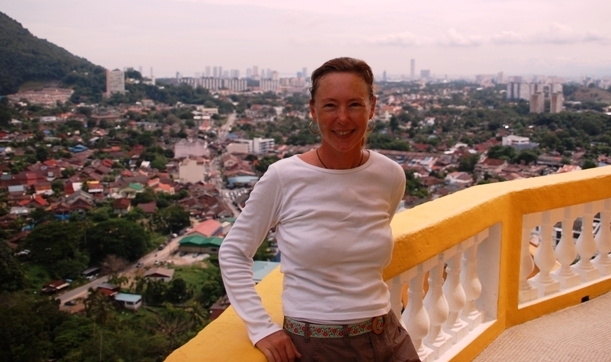 Tove and Fin (s/v Xanadu) happened to also be at Telaga and we had a fun dinner of tapas together overlooking the marina. Nov 12 we made the 65 mile run to Koh Rok Nai in THAILAND! This was a quiet spot with clear water and loads of coral...okay, we nicked one bomie as we picked up a National Park mooring ball...drat...but no damage done (Chris checked). That nick rattled Erin's nerves a bit but she shook it off as we made another long day hop to Koh Rang Yai...anchoring at 4.30pm (Nov 13). Pizza and sundowners were enjoyed after a quick swim in the warm waters of Thailand. Nov 14 we followed a pilot boat into Royal Phuket Marina because depths can get pretty low...we saw the depth dip to a mere 8 feet (our draft is 5 feet) at HIGH tide (www.royalphuketmarina.com). What a warm reception...two Thai ladies helped us tie up Barefeet and then welcomed us to the marina...with cool, scented wash cloths presented on a tray. We think that we are going to like Thailand. 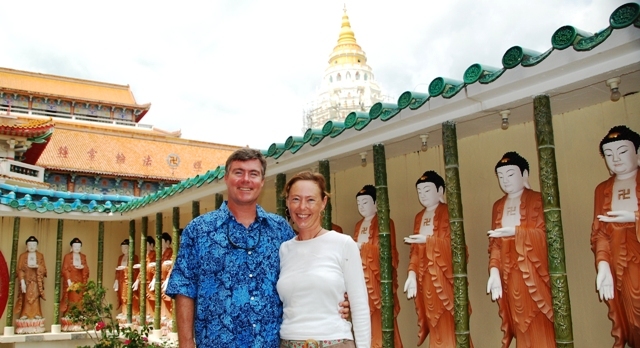 Holy cow, our heads are swimming with the completion of another sailing year...from Brisbane, Australia to Phuket, Thailand. Well, this is it until January 2009 when we will depart to cross the Indian Ocean, enter the Red Sea and exit into the Med. For now we will get the boat hauled to re-paint the bottom with anti-fouling and replace the zincs (last done in Raiatea, French Polynesia), repair two sails and several other boat projects we want to get squared away before next year. 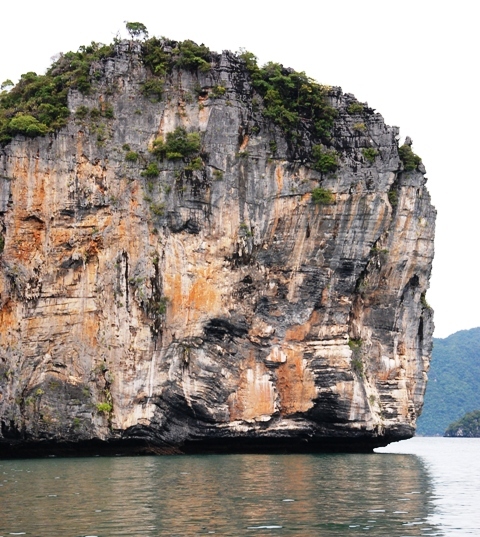 Plus, we plan to explore the fabled islands around Phuket with their jade green waters and spectacular cliffs that leap from the sea.